As I look up at the Orchards Corner clock – it is 2pm but one of its faces says 5:20 and the other 7:25 – the crackle of a round of fireworks erupts from the direction of Chinatown. I follow the source of the sound, walking down Quay Street until I catch sight of two red and gold lions, cavorting amid a cloud of fireworks smoke outside the noodle shops in the courtyard on Thomas Street. Once the fireworks have burnt through, the lions move on slowly, further into Chinatown, as people descend on the pile of red fireworks papers with brooms, sweeping it up before the wind can disperse it. I watch until the lions dance across the street, and then turn towards the restaurants on the ground floor of the Prince Centre, the mall that fills the corner block. The restaurant I know best here is the Chinese Noodle house, with its plastic grapes hanging from the ceiling, tapestries hanging on the walls, and the tables in a tetris-like arrangement that leaves only just enough space to sit down at them. For years I came regularly to the noodle house before realising that it was connected to the mall behind it on Quay Street. On the Quay Street side it has a plain facade, but on the Thomas Street side the building tapers to a point, opening up into a courtyard with glass stairwells at either end. For as long as I’ve been visiting them I’ve loved the malls in Chinatown: the mirrored interiors, escalators and food courts and the travel agencies, hairdressers, fashion boutiques and herbalists, that are collected within. Aside from the busy food courts, the malls have a mood of quiet industriousness, their businesses tucked away above street level, there for those who need or want to find them. The majority of Chinatown’s malls were built in the 1980s, and Prince Centre is a good example, with its pink granite tiles, peach and grey colour scheme, and palm trees. One tree is interred inside an octagonal glass box alongside what is now a drained water-feature, which makes a perfect place to sit to wait for a table in the Chinese Noodle House. Sometimes the proprietor of this establishment comes out with a violin under his chin and plays a tune, using the acoustics of the courtyard to good effect. On the Quay Street side of the Prince Centre there was, until its partial renovation a few years ago, a cascading crystal light feature and a ceiling decorated by thousands of white scales, which produced a shimmering, seashell-interior effect. This interior was modernised in 2015, and replaced with a plain ceiling instead, although some of the 80s details persist. The next mall of this kind is at the corner of Hay Street and Thomas Street: the Citymark, on the lower two levels of a late-80s-era office building. It is a fairly plain commercial building, but upon scrutiny of its facade it looks recognisably dated, a product of the late 1980s, as certainly as shoulder pads in a jacket. To build it, an 1800-seat picture theatre was demolished, one of the many that were built in Haymarket in the early 20th century, when this was the city’s theatre district. The Citymark cuts through from Thomas Street to George Street, through an arcade of shops selling products such as shoes, cosmetics, and rice cookers. I often take it as a shortcut, but rarely have a need to venture upstairs. As is usually the case, the upper levels of the malls is a tranquil place, with few people around. I startle when I look through the window of a shop with a plain facade and see two headless mannequins in hazmat suits poised for action (the fork and spoon were a clue to its identity: it’s the office for a restaurant delivery service). Across from this store is China Books, which has a copy of The Hungry, Hungry Caterpillar in the window, and a view out towards Dixon Street and the Market City mall. Of all of the Chinatown malls, Market City has the most conventional interior, and perhaps the most bizarre exterior, a postmodern collage of architectural features. Built to incorporate the shell of the 1909 market building, Market City resembles a rambling castle, with turrets and columns and cupolas, the kind a child might draw to fill up a sheet of paper. At the back of the castle, a residential tower of 48 storeys mushrooms up, so tall and embedded within the overall structure it seems oddly invisible from street level. I have an affection for the one square window in the brick wall beside the Ultimo Road entrance of Market City, through which piles of folders are visible. It is the only window on an otherwise-windowless long wall, and after looking up and noticing it once, it has been conspicuous to me ever since. Across Hay Street from Market City is Dixon Street, its ceremonial gates with green-tiled canopies marking each end of the pedestrianised section that forms the Dixon Street mall. The pedestrian mall was created in 1980, when the street was closed to traffic, a deliberate attempt to formalise the area’s identity as Sydney city’s Chinatown. There has been Chinese businesses in this area since the 19th century, although the location of Chinatown had moved a number of times before this: first in The Rocks, then Surry Hills, before settling in Haymarket. Although now Dixon Street is thought of as Chinatown’s centre, its boundaries have shifted and continue to do so. In the early 20th century, Chinatown was thought of as spanning Surry Hills and Haymarket: “a winding dragon with its head in Campbell Street, its body curling up Ultimo Road and its tail in Dixon Street”. The creation of the mall in 1980 settled Chinatown into this part of the city, reclaimed land which was once a swamp with a creek which fed into Tumbalong/Darling Harbour. The lion dancers are at the end of Dixon Street now, and I watch them tossing their heads, dipping and weaving, as the fireworks bang and sizzle. Throughout their dance, Elder Paik stands at the side of the gates, continuing to spin a green hula hoop from his usual busking position. Paik, who is now in his 80s, is reliably found in this spot, wearing white facepaint and outfits wreathed in fake flowers, twirling a hula hoop around his hips. Underneath the crackle of the fireworks the drummers beat out a steady rhythm, giving the lion’s steps a regular pace. There is a crowd of people around the lion dancers and so I walk up to the very end of the Dixon Street mall, skipping over Sussex Centre and Dixon House for the time being, until I reach the Harbour Plaza building at the northern end. It is best known as the location of Eating World, the chthonic food court on the ground floor with its rows of worn and sticky laminex tables. For many years the bar here was staffed by a man who had an impressive crest of lacquered hair and always wore a cravat, a style which made me feel I should be ordering a cocktail rather than a chrysanthemum tea. Underneath Eating World is an arcade which, on this Saturday afternoon, is deserted apart from a few people sitting inside their stores: a nail salon, a foot massage place with decals of huge hands pressing into huge feet, and a real estate agency which had, hung up in the doorway, a lettuce for the lions, a red envelope attached to it with a toothpick. I could hear from the drums that the lions were approaching, so I doubled back along the mall and into the Sussex Centre, the brighter of the two central Dixon Street malls. Both it and Dixon House have interiors like an Escher engraving, their plentiful escalators producing a confusing optical effect, but Sussex House particularly so, as the levels of shops ascend in a series of ramps that lead up to the food court on the top level. As I walk inside the Sussex Centre I remember that in the 1990s there used to be a Laserdisc shop on the Sussex Street side of the shopping centre (for those who don’t remember them: CDs the size of vinyl LPs, pretty much redundant by 2000). In the 90s I’d pass by it on my way upstairs to have a Happy Chef laksa, sitting at the window facing the old Boyd and Hanlon produce store building on Sussex Street. Until recently it was decorated by faded L and P signs, an advertisement that I enjoyed for its lack of supplementary signage. My favourite Chinatown mall is Dixon House, on the corner of Little Hay Street. Built inside the shell of what was formerly a Myer warehouse, it was completely remodelled in 1983, when it was bought by the heiress to the Tiger Balm fortune, a Hong Kong businesswoman named Sally Aw. She sold it in the 1990s, and then it was sold again last year, and described in the article announcing this as a “D-grade commercial building”. Building grades are probably not the same as movie-grades, but even so, I will spring to Dixon House’s defence. My love of it comes from it being an 80s time-warp, with mirrored ceilings and columns, pink walls and carpet, artificial plants and a collection of small, independent businesses. Like Eating World its basement food court has a worn atmosphere, although it does have the additional novelty of the mirrored ceiling. Eating noodles in 2005: little has changed from this scene apart from the 3.2 mp digital camera. At the Dixon Street entrance are two directories that list the businesses inside, some of which seem to no longer be in residence, including the enigmatic Dockets and Forms Australia Pty Ltd. Escalators lead to the upper levels, and underneath them is a watch store, with a Seiko neon sign of a diamond. The usual Chinatown mall collection surrounds it: travel agencies, fashion boutiques and hairdressers. At the Sussex Street entrance is the tiny office for John Wong, Chinese Soothsayer, which has photos of him with prominent past politicians and at local events in the window. I step onto the escalator, entering more deeply into Dixon House’s peaceful, mirrored world. Mirrors reflect off mirrors, so the journey up the escalators appears to be transporting multiple versions of me forwards, backwards, upside down and into other dimensions. In the back corner of the top level is the legendary Ching Yip coffee lounge, a Hong Kong-style cafe-restaurant. Enter through under the pink neon sign and you find yourself in a pink and grey, laminex and vinyl oasis, soon examining a menu printed on pink paper, listing hundreds of items, from Hot Lemon Coke and Hot Tea & Coffee Mix to rice, pasta and borscht. In the corner, a cake fridge glows, its contents mostly lemons. When I come to Ching Yip I usually have jam toast and tea with lemon (it seems important to help out with the lemons), and while I consume these I take in the cool, quiet, pink atmosphere. Tinkly musak plays in the background, and I stare over at the line of tropical fish ornaments behind the counter, and the ads for Fanta and the laminated pink menus offering the afternoon special. Often it’s busy in Ching Yip, but I’m here at an in-between time, and so mostly my company is the artificial palm trees and the framed pictures of flowers and sailboats. After I finish the tea I leave Ching Yip and descend down via the mirrored escalators, heading towards Dixon Street. The lion dancers have moved through and gone, leaving a trail of the red paper from the firecrackers in their wake. The red scraps mix up with the pink petals from the crepe myrtle trees, which are blooming for this last, humid month of summer. Both the red paper and pink blossoms seem to promise good luck for the new year ahead. The quote about Chinatown being in the shape of a dragon is from Shirley Fitzgerald Red Tape Gold Scissors. Some of the Dixon House backstory I learnt on tour of Chinatown conducted by King Fong, thanks to Philip E for inviting me. The train emerges from the tunnel towards Circular Quay station and the darkness outside the windows is replaced by a long, thin panorama, a horizontal slice of sky and water bracketed by the Harbour Bridge and Opera House. It’s a living postcard, animated by the ferries and the clouds, watched by those waiting on the platform. People lean against the glass barriers to take photos of the harbour, or just gaze out, watching the ever-moving scene in front of them. I join the throng clogging the top of the steps that lead down to the concourse. I hang back, not in a hurry, and wait until I’m the last to descend. As I walk down, I look above the stairs to where, set high up into the wall, there are ornamental grilles decorated by bronze fish. They have a stranded look to them, a little bit dusty, but with their rainbow sheen still visible. I always look for them, one of the few decorative features of this station which, since its opening in 1956, has been relentlessly condemned as ugly, interrupting the view of the harbour from the city, and the city from the harbour. The construction of the station and the Cahill Expressway above it was a drawn out and unpopular process. Things came to a head at the 1958 opening of the Cahill Expressway, when despite the premier’s announcement that this was “a striking symbol of Sydney’s growth and maturity”, things did not go as planned. If Circular Quay station is maligned, the Cahill Expressway is even more so. The railway line and the road above it forms a thick line that cuts across the view, as if it’s a low, wide belt keeping the city in check. There has often been talk of the expressway’s demolition: in 1994 Prime Minister Paul Keating even offered the NSW state government the funds to remove it. Yet it remains, visually intrusive, loved by no one, but not entirely without charm. A side-effect of maligned places is that people avoid them, which can, sometimes, twist their atmosphere into something unusual and interesting. The Cahill Walk is a good example of this. To get to it I move quickly along the Circular Quay promenade, past people munching through pancakes at City Extra and passengers coming off the Manly ferry. Details flash up: a man wearing a t-shirt that says “winter is not coming”; the round bronze discs set into the pavement that commemorate famous writers. I step over A.D. Hope, Barry Humphries, and Kenneth Slessor, until I’m at a grove of palm trees hemmed in by concrete, that surround a glass elevator clamped to the side of the railway line and road above. I press the elevator call button and soon the doors open in front of me, puffing out a cold, air-conditioned breath in welcome. I step inside, the doors seal me in, and the noise of the quay recedes. I’m inside a bubble, ascending, above the tops of the palm trees now, the view of the Harbour Bridge coming clear the higher up the lift rises. At the top, the doors behind me open and I turn to face the four lanes of traffic on the expressway. A long, concrete walkway extends beside it like a grey ribbon. Never, in all the times I’ve been up here, has there been many other people here. It’s one day of popularity is New Year’s Eve: a ballot operates for tickets to watch the fireworks from here. At other times, you might very well have it to yourself. This morning there’s almost no one else but me, apart from an occasional runner jogging by. It’s only a slight change of perspective from the Quay below, but has a completely different mood. If it weren’t for the incessant traffic, and the way the path trembles underfoot when heavy vehicles go by, it would be a tranquil, pleasurable place to be, rather than the exposed and sometimes slightly eerie experience it is to walk here. The traffic speeds by, having just come off the Harbour Bridge. I watch the intent expressions of people behind the wheels of their cars, notice a man on his motorbike singing as he rides along, and feel the path shudder when a demolition truck goes by, the word CHOMP in orange across the front. On the other side is Warrane, the bay dominated by a gargantuan cruise ship with a steaming funnel like a kettle just come off the boil. The poisonous smell of the diesel fuel drifts across. On the front of the cruise ship is a man in overalls, tethered to a railing above, holding a paint roller on a stick, repainting the ship’s nose. The expanse of fresh white paint follows him as he moves slowly along. Walking up here, alongside the expressway, is to have a feeling of floating mid-air, looking into the thicket of city buildings to one side and the harbour’s expanse on the other. Below where I am on the Cahill Walk, the crowds of Circular Quay mill and disperse. Up here I’m alone, with traffic and jackhammering and construction noise filling the air as I look towards the building sites on the city’s edge. Behind them are dozens of office buildings, thousands of windows, each framing a view of the harbour. Anyone looking out of them at this moment would be moving their eyes over the same scene as me, watching the harbour, the ferries, the shifting clouds, that familiar scene, slowly changing. Thank you dear readers for following Mirror Sydney in 2018, a busy year for me, with the book out in the world. It was a delight to meet some of you when I had launches and talks, and I look forward to more in 2019. At the edge of Chinatown is the Sydney Trades Hall, a Victorian-era office building, four storeys high, with an octagonal tower jutting from the corner like a lantern. When it opened in 1895, this area was near the wharves, railyards, and industrial areas on the city’s fringe, areas that employed many of the workers who belonged to the trade unions who had offices inside the building. On the main staircase there’s a list of the union offices that once were found within Trades Hall. It’s an index of the city’s past occupations, among them bread carters, sailmakers, glass bottle makers, food preservers, Pyrmont Sugar Workers, milk and ice carters. The building would have been a lively place, with all of these offices, a literary institute library, and nightly social activities, concerts and dances and meetings. Now the building is part-offices, part-museum, after being refurbished in the 2000s. I’ve come on a tour as part of Sydney Open, the annual weekend on which buildings of historical and architectural interest are open to the public. On the ground floor I walk in past an old, wooden elevator with a banner for the Lift Attendant union displayed inside it. There are other such banners hanging in the nearby hallway, for cleaners and for watchmen, and a framed painted list of offices, with a delicate painted hand pointing upstairs. The building houses objects related to its history: the signs that once hung in the hallways, the banners that unions used in marches and processions, and the certificates and banners used by the unions to signify or reward membership. The large painted banners are ornate and symbolic, decorated with gold leaf. Their painter was Edgar Whitbread, who worked for decades, well into his 70s, at a small studio in the glass-domed Victoria Arcade. His name can be seen printed modestly at the base of these banners, which were once used in the processions and demonstrations that would bring thousands of people onto the city’s streets. Their detail and meticulous craftsmanship are surprising to the contemporary eye, and we can imagine them held aloft, as the workers they represented marched with them. It was in the 1960s, the heritage officer leading the tour tells us, when the building was under threat of demolition, that thought was given to whether the banners should be preserved. That they were owes much to the Trades Hall secretary, Lorna Morrison, who advocated for their restoration. The banner had been stored in a part of the building that was at the time opened up as a walkway between the original building and the new Labour Council building behind it, a grey office block with painted advertisements for the on-site broadcaster, 2KY radio, on it. Other objects on display, he said, were found piled up in the basement during the refurbishment in the 2000s. These objects now tell the story of the building, but also of the world of work, and how Sydney’s workers have shaped the city. In 1950, the Smith’s Weekly newspaper published a series of profiles of city workers titled ‘Men in Odd Jobs’. The first article appeared in July, profiling Mr J.A. Sinclair, who spent his days testing lawn bowls for accuracy. Next readers met a skeleton articulator at the Australian Museum. Then a man who drills holes in buttons: Mr Ern Sheather who confides that “drilling holes in buttons is soothing to the nerves”. In September, under the headline He Frightens Spiders, was the story of an instrument maker who places spider webs in the theodolites used by surveyors for measuring angles. One day two men were standing outside the Commonwealth Bank in Pitt Street, when one of them dropped his keys down an open grate. He was in a terrible state, and began to wonder how he would carry on his work. His friend said it would be possible to get police to remove the grate. Just as they began to panic, my mate poked the keys back through the grate with two fingers. The men stopped talking and gaped at the fingers with the keys dangling. They couldn’t see us below, but we could see them in the daylight. One man said: ‘Look, a human hand and alive.’ The other snatched the keys with out saying a word and went for his life. I can imagine this was a story Mr Stanley told often, relishing the description of the fingers poking up through the manhole, working up to the delivery of the “Look, it’s a human hand and alive!” punchline. There are fourteen “odd jobs” stories in all. Of these, four relate to postal and telephone services. In addition to the Inside-Out-Bag Turner, the man who maintains the machine that produces the dial-tone, the franking-stamp changer, and the man who opens the door of the vault in the Bank of NSW, is the one woman featured in the series, Miss Mary Sprague. Miss Sprague had the unusual job of reading the time live at the Sydney GPO, which housed the city’s central telephone switchboard. Before the installation of a mechanical ‘speaking clock’ in 1954, the job was done by a group of women who took turns in sitting in front of a clock, reciting the time into a microphone. Miss Mary Sprague explained how the intensity of the task made it difficult to read for more than 20 minutes at a time. I’d never thought that such a job as time-reading would have been done live, but in the days before digital timekeeping it could be difficult to maintain accurate time on mechanical clocks and watches. When people wanted to check if their watch was correct, they called the service, dialling BO74. Up to 20,000 people would call daily and it was particularly busy around 5pm, as people hoped their watches were running slowly, and the time to leave work had already come. The article on Mary Sprague was the first of the “odd jobs” series I read. I found it while researching an essay I’ve written for Time and Memory, a new book published by the Museum of Applied Arts and Sciences. A few months after I read the article about Mary Sprague in Smiths Weekly, I was doing a reading at the Paragon Cafe in Katoomba. I mentioned the essay I was writing to Robyn, the cafe owner. Speak to Joyce I did indeed, and you can read my interview with her at Reading the Time with Joyce Thomson, on the museum’s blog. When I spoke to Joyce, who is now in her 80s, she described how it had felt to move to the city, from Katoomba, as a young woman in the late 1940s. The scale of life opened up for her and there were possibilities all around. By reading the time at the GPO she joined the ranks of those in the city doing an unusual job. Now, like most of the jobs that Smiths Weekly reported on in 1950, this job has slipped from public knowledge, long-since having been technologically superseded. But just enough of a trace of it exists, for it to be remembered. The arrow points towards the underground passage, urging me to “Keep on Walking”. Ahead of me is a white-walled tunnel, its curved ceiling and unadorned walls making it more resemble one of the hallways from Star Wars than a pedestrian underpass. There are no advertisements on the walls, no graffiti, just a string of round, black ventilation grilles that look like portholes, and two stripes of fluorescent lights along the ceiling. This is one of my favourite Sydney tunnels. Its starkness is a respite from the visual clutter of the city, as if I’ve slipped into a connecting piece between the present and the past, or some other kind of Sydney. Even at peak hour it’s not a busy thoroughfare. More often that not I walk through it alone, expecting a band of Stormtroopers to come marching out from exit midway along it. But the only action is the few pedestrians heading between Museum train station and the office buildings above. The Star Wars connection is not as much of a stretch as it could be: the underpass was built in the late 1970s, around the same time as the film was in cinemas. It was part of the Hyde Park Square development of two office towers and an underground arcade and sunken plaza, all connected to Museum station by the tunnel. I reach the end of the tunnel and it widens out into a shopping arcade. On one side is one of the few remaining ceramic murals by Vladimir Tichy. It is a long wall of textured, bark-like tiles, with sets of vertical bars made from glazed, white bricks, which look like spears of bamboo, or stalactites on the roof of a cave. On one panel is the marker’s mark, carved in relief into the clay: Designed by V. Tichy, 1977. Tichy is a ceramic sculptor who came to Australia in 1968 from what was then Czechoslavakia. He set up a studio in Parramatta, from where he produced many large-scale ceramic murals for public and office buildings, RSLs, and civic centres. There were once many Tichy murals in the city, but now the only other ones are in the lobby of Macleay College on Foveux Street, and at the entrance to Newton’s Pharmacy on York Street. The rest have been destroyed as 70s buildings are renovated or demolished. Beyond the mural is the square itself, a sunken plaza between the two buildings. Designed for office workers’ lunches it had clusters of chairs and tables and a big, curved concrete bench you could either side on the inside or outside of. Now most of the square is taken up by a childcare centre, with soft artificial grass and a sandpit. A new sixty-five metre tunnel under Elizabeth Street was opened in 1978 to take pedestrians from the complex to Museum Station. The new tunnel was given a modern-art atmosphere with wide bands of colour. The smooth lining of the tunnel was made of a specially toughened material and was said to be vandal proof. At first, the white paint seemed to cover the wall panels so well that there was no hint of what colour it must have been before. The white paint extended tightly into the cracks, from floor to ceiling. I stood up close to it, scrutinising its surface, looking for the tiniest flake or chip to reveal the layer behind it. The surface was slightly rough, but uniformly off-white: it gave nothing away. I stepped back and looked around the tunnel, towards the side exit. Here a metal arrow on a pillar gestured obscurely to the right, devoid of any other guiding information. I looked back to the white walls of the tunnel and saw something I had not yet noticed. Just visible was a slight change in texture, in the shape of a diagonal line. I followed it with my eyes. Near the curve of the ceiling another line intersected it at right angles. Then another line intersected that. I walked slowly along the tunnel, my eyes on the lines, and they came into life, diagonal stripes and squares. All of a sudden I notice a line of scraped marks at the bottom of one of the panels, which revealed slivers of bright green underneath the white coating. The next panel was scraped too, revealing yellow. As I stood in the white tunnel it flooded into colour in my mind’s eye. Diagonal bands of green and yellow came into bloom. I felt a transformation come over me, too, as if I could, in that moment, see through time. Opening my notebook, I quickly sketched out the lines and shapes. To emerge from the tunnel that leads out of Wynyard Station onto George Street is to enter a sonic mess of construction noise. There are bursts of deep, jarring reverberations and the sounds of metal against concrete, as the demolition of the buildings above the station continues. As the buildings – the Menzies Hotel, and the 1960s office block Thakral House – have been demolished, the walls of the adjacent buildings have come to light for the first time in 50 years. As Thakral House came down, sunrays appeared at the top of the side wall of the building on the north side, Beneficial House. Then a creature, a dog with a bushy tail, inside a red shield. And then, underneath it, the word PEAPES. At first the hoardings were too high to see much of the sign from street level, but as the demolition continued, the full breadth of the Peapes sign was revealed. Peapes was a men’s clothing and tailoring department store, which operated out of Beneficial House from when the building was erected in 1923, until the close of the business in February 1971. Its advertising emphasised the “lofty and spacious departments, where a leisurely peace reigns”. The showrooms were fitted out in polished maple, with Doric columns supporting the ceiling and a circular light well at the centre. It was an elegant place, in-keeping with the quality of Peapes’ goods, which were stressed to be of the highest degree. Peapes’ slogan was “for men AND their sons” (the AND was in upper case, to stress the importance of intergeneration consistency in men’s style) and it was the place to shop if you needed any kind of gentleman’s outfit, from necessities to luxuries: jackets, shirts, hats, shoes, “an unusually smart shirt with tie”, “a distinctive overcoat”, “superior flannel trousers”. Clothes could be bought off the rack or made to measure. Peapes sales representatives also travelled to country towns across Australia to conduct fittings, booking out rooms in hotels, advertising in local papers, for men to come and have their measurements taken for suits. The store had two tradmarks. The first was the Warrigal – a dingo, Warrigal being the Dharug word for dingo – the one pictured at the top of the wall sign. The second was diarist Samuel Pepys, an ancestor of one the firm’s founders, George Peapes. On the third floor of the department store was the Pepys Room, a common room of sorts, “a room of restful atmosphere…for reading, writing, smoking, or keeping appointments”. The bewigged Samuel Pepys also appeared on the labels of their garments. Peapes had been operating on George Street since 1866. In 1912, the wealthy businessman W.J. Miles became one of the directors. These days his name may not be a familiar one, but his daughter, Bea, was one of mid-twentieth century Sydney’s most well known characters. Her distinctive figure, in long coat and tennis hat, was a common sight in the city and suburbs, seen climbing in and out of the taxis for which she never paid the fare, or quoting Shakespeare on demand for a fee of sixpence. 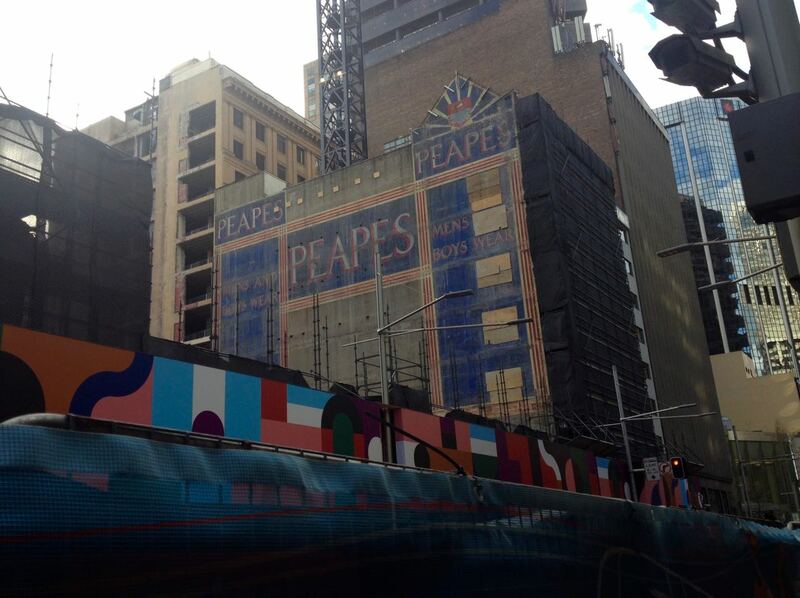 The royal blue of the Peapes sign is a bright window into a past Sydney. Thousands of people walk past it daily, and for those who look up and notice it, the texture of the changing city is revealed, its layers and traces. Soon the demolition will be complete. A new building will be constructed, covering over the Peapes name, the sunburst, and the Warrigal dog. But, for this brief moment, it is back in the light. With thanks to David Lever for Peapes memories and investigations. Approaching the Sirius building I can see the group I am to join already assembled outside, waiting for the tour. They gather in the forecourt, a brick-paved area with circular garden beds, in which grow banksia trees and jade plants, and a hibiscus flowering with pink blooms. Among the people waiting there moves a tall man wearing a purple shirt. He is handing out flyers, talking with verve as he does so. This is Tao Gofers, the architect who, in 1976, designed the Sirius building, and has been working with the Save Our Sirius group to protect the building from demolition. The Sirius is one of Sydney’s most iconic buildings, instantly recognisable due to its striking modular design and its prominent position beside the Harbour Bridge. Its stepped shape of concrete blocks and roof gardens with purple funnels rise up alongside the Bridge. It seems almost close enough to be able to reach out from the Harbour Bridge walkway to touch them. At least this is what I imagined as a child, as I, like generations of Sydney residents, wondered what it would be like to live there and explore on the rooftop gardens, looking out over the city. The Sirius is a building that gives much to the imagination. It’s a people’s building, both because it was designed as social housing and operated successfully as such for four decades, and because it has such a strong physical presence in the cityscape. It’s a building that’s embedded in the city’s collective consciousness, as important and as controversial as it was when it opened in the late 1970s. Illustration of the Sirius from 1970s Housing Commission brochure, image courtesy of Tao Gofers. We are taken back to 1976 as Tao Gofers describes the process of designing the Sirius. At that time there had already been demolition of social housing properties and relocation of residents in the area. A condition of lifting the green ban that had been imposed on area by the Builders Labourers Federation was that that there be provisions for the working class community who had been living in the area for generations to remain in The Rocks. Until the Ban was lifted, the government could make no changes to their existing properties in The Rocks, and they were eager for the stalemate to be resolved. The Sirius was the key factor in the lifting of the green ban. It all happened quickly: there was only 10 days between Gofers first hearing of the project to his presentation to the stakeholders. He describes the scene, the government officials in double-breasted suits, and the Rocks residents “like us”, people in their everyday clothes, who had gathered to see his proposals. He first showed a design for a small development of 14 terrace houses, which was unacceptable to the government. Next he showed a proposal for a 20 storey building with 8 apartments per floor, which was unacceptable to the residents. A third proposal, for a standard tower block of 80 units was also rejected for being aesthetically displeasing. Then Gofers presented the proposal for the Sirius. The design was presented as a compromise between two extremes, but it was the one that Gofers believed in, and the one that came to be built. Tao Gofers describes the Sirius building planning process. Sirius was based on The Laurels, an earlier apartment development Gofers had designed in Sans Souci. The model for The Laurels had been made with Revlon eyeshadow boxes, which had the right kind of dimensions for the windows that filled the ends of each concrete module. The Sirius was an expanded version of this design, which combined 1,2,3 and 4 bedroom apartments, as well as apartments specifically designed for the elderly and people with disabilities. We walk around the building, looking up at the apartments as Tao describes how of the 79 units, 74 have access to a balcony, terrace or roof garden. “If you have just little boxes,” he says “people aren’t going to be happy.” His designs were made with people’s emotional bond to their homes in mind. These were not purely functional spaces, although their simple design made them adaptable to the multi-level site. It included numerous communal areas, including the Heritage Room on the 8th floor, designed as a common area for older residents, and the Phillip Room on the ground floor, with red patterned carpet, wood-panelled walls, and dramatic beams of raw concrete. The wooden figures that decorate the walls of the Phillip Room. We cannot even glimpse into the Phillip Room now. The windows are completely blocked off with black plastic, for no other reason but to prevent us looking inside. All we can see is our own reflections moving by. The group is big, around a hundred people. We stand at the back of the building, staring up at the apartment balconies where succulents grow wild and unpruned from the planter boxes. Almost every one of these apartment is empty. The government has been moving residents out since 2014, with the intent to sell the building and have it demolished. Despite the recommendations of its own Heritage Council, heritage listing was refused, and it is this decision Save Our Sirius campaign is working to fight. Accompanied by security guards, we crowd into the foyer, and then go in small groups in the lift up to level 10 for a look inside Myra’s apartment. Myra, who is 90 years old and has lived in this neighbourhood for almost 60 years, has become the face of the Sirius building. Myra is blind, and has no wish to move away from the familiar apartment and area she has been a part of for so long. This morning she is at the front of the building, sitting in the forecourt with a drawing group assembled around her, sketching her on their notepads. Upstairs, groups of people stand in her living room, looking around. It is the homely environment of an elderly person, with its teaspoon collection hanging on the wall, framed photos and knicknacks arranged on the shelves, and a horseshoe hung up in the hallway as a luck charm. The windows fill the entire of the eastern wall and through them is a view across the harbour. The SOS lights (for Save Our Sirius) in Myra’s bedroom window. This, Tao says a number of times during the tour, is a sticking point – the idea of people who are not privileged, not wealthy, living with this harbour view. Standing in Myra’s living room, looking out at the clouds moving across the sky and their reflection in the steel-grey water, it is indeed beautiful. No one could deny it, and anyone living with such a scene as part of their daily lives is lucky. But luck and beauty should not be the exclusive province of the wealthy. A city where money and privilege dominates pales even the most glorious view. From its inception the Sirius has been symbolic of the city and the harbour being available to all, and it is even more so now as the majority of its apartments lie empty, and the fight to save it continues. Follow the Save Our Sirius campaign here with links to details of future tours and campaign events.